Now that you have one of the best ignitions available for your Classic car you will no doubt want the experience to be the best. So why not make the ignition system the best it can be by adding new plugs, wires and a coil of not less than 1 Ohm. 1.) A lot of problems are caused by a bad primary ignition circuit, specially high rpm problems. This means the circuit: Battery (+) --> Contact switch --> Coil (+) --> Coil (-) --> Ignition (black wire) --> Ignition to ground (minus (-) of the battery must all be in top shape. This total circuit has a very low resistance. For example 3 Ohm when you use a Bosch blue coil or 1,8 Ohm with a Bosch red coil. You will get a weak spark when there is a bad connection (resistance) somewhere in this circuit (for example a bad contact switch or a bad connection between the ignition and the battery (-). 2.) Never trust old coils as they may have been subjected to overheating which would damage the coil. 3.) Most cars are well along in years and have had multiple owners so what you see is not always correct in the wiring. Make sure the correct wires are going to the +ve and -ve side of the coil. While the car may run with the old points if the wires have been crossed it can keep the 123ignition from functioning properly. 4.) Weak Spark, Use a good quality spark plug wire if you have a weak spark. Check all connections in the ignition circuit for bad connections. I would check the voltage of the coil under load. Emphasize there needs to be good connections everywhere. Also check the GND and try another coil. 5.) Re check your wiring. On TUNE models the Blue wire (curve 1) goes to a good ground. The yellow wire goes to a power source (6 or 12v) and when it is energized provides curve 2. 6.) 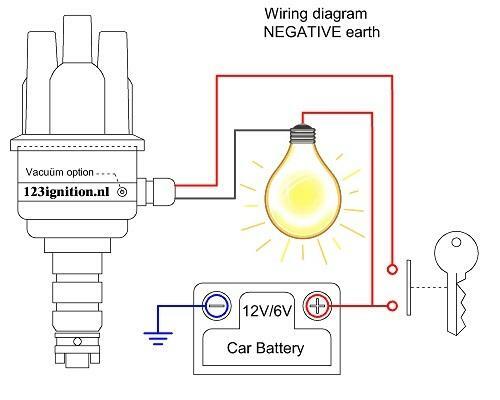 Light bulb test in the car. Basicly you are replacing the Coil with the light bulb for the test. If you have found some helpful hints for unforseen installation issues please share them with me so I can post them here. Where can I buy 123ignition products? What PC operating systems does the USB programmable 123\TUNE software run on?